Frank Yao asked how to free up space on his local, internal drive. I've already discussed how to free up space in Windows itself and in your various installed programs. This time, I'm concentrating on libraries and data files. If you're like most people, these take up most of your space and most of your waste. But there are limits to my advice. I can't tell you exactly what to remove; that's a decision you'll have to make for yourself. All I can do is suggest some techniques and free tools that can make the job easier. You want this job to take minutes, not hours, so concentrate on large files and large folders. A 1K file takes as long to delete as a 1GB file, but the 1GB file will free up a million times as much the space. Large folders often contain large files. And even if they don't, they might contain very large numbers of obviously pointless small files. To find the large files and folders, I suggest you use Mind Gem's Folder Size. With its pie-chart display, drill-down capabilities, and its Windows/File Explorer integration, it handles the job easily and quickly. The free version will probably be sufficient. However, you may want to check out the additional features in the $25 Personal edition. If you have multiple, identical copies of the same file, you've got waste. But finding those duplicates on your own is pretty near impossible. 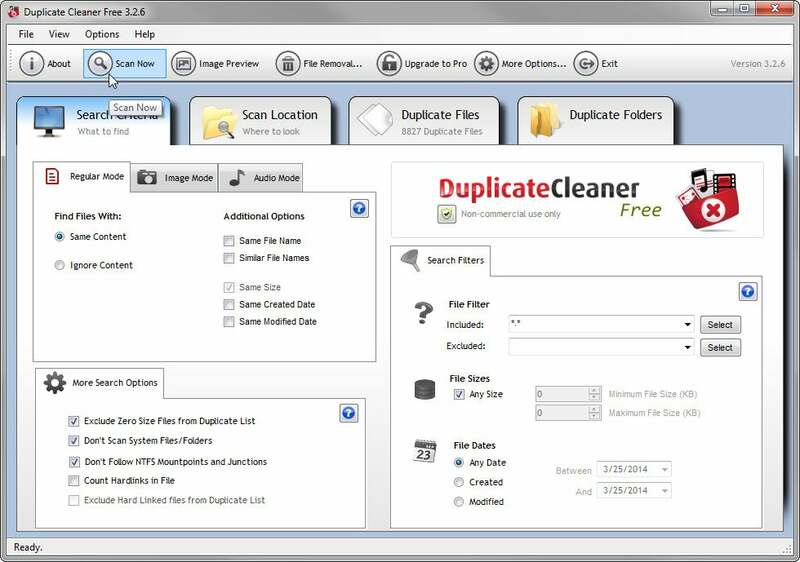 That's why I'm recommending the free version of Digitalvolcano's Duplicate Cleaner. You may want to consider the additional features in the $30 Pro version. Duplicate Cleaner allows you to define a duplicate. For instance, you can insist on the same Content, Name, Date and/or Size. (If you select Content, Size is grayed out for obvious reasons.) You can select where you want to search and set up filters by name, date, and size. There are special options for photos and music, although the photo options are only available in the pay version. I suggest you only select Same Content in the Regular Mode tab, and leave everything else at the defaults. When the scan is done and you move to the Duplicate Files tab, click the Size column head twice, to sort by size starting with the largest files. Then start at the top, considering what you want to delete. By the time you get bored, you will have freed up the largest, and thus worst, offenders.